My moondoggy and me | ((jetset))bf! As we approach our first anniversary, my moondoggy and I step further and further out of the shapeless abyss and into our bodies dancing together. And in the process of taking form, we ever discover small secrets and delights — hidden not for their shimmering angry brightness, in fact not hidden at all, just uncarefully stowed away in oops-I-forgot-about-that cranial caches. As we walked through the toy isle of Walgreens searching for humorous and happy delights to gift a friend at her quarterlife bowling party, we stumbled upon a shiny red Duncan yo-yo. A cheapie, of course. But in my moondoggy’s hands, they were both transformed — memories leaping out of those oops-I-forgot stows to his anxious fingers and lips — he became a glowing boy much larger in life than his friends and that cheapie yo-yo shined with sparkling man-becomes-boy magic. Suddenly the afternoon became I-can’t-believe-I-forgot-abouts all over the place — kiosks in the mall, yo-yos of the past, competitions with friends, talents and tricks, grade school social strata, and fads. When I was 7 or 8, I wanted one of those sticky gel hands you could throw against the wall and watch ooze down, so I begged my dad for a quarter at the grocery store checkout. His precious quarter became a lesson in fads, planned obsolesence, and oddities marketed only to children. Maybe what I wanted more than thing-itself (the noumenon) was the phenomenon of it all — popping the translucent red lid off the plastic bubble, sticking that toy to the end of my fingers, yakking it at the wall with might, and watching it slurp to the carpet and become dotted with blue carpet fuzz. I didn’t get that oozy-sticky-hand at the grocery store 16 or 17 years ago, but I did buy the cheapie red yo-yo at Walgreens. And it transformed my vision of my moondoggy. He has a hidden talent! I couldn’t help but watch him giddy as could be with heart-beaming pride and admiration — (I can do nothing with a yo-yo but make massive tangles of string). As he brought it home to our family of cats, that cheapie red yo-yo became the most exciting thing we’ve ever owned! So here I share his hidden talents with you — I’m gifting you one man’s small happy memory from childhood (wish I could show you the Lisa Frank novelties we gifted our quarterlife pal !) as a reminder to allow joy into your adulthood, to never assume your significant one is what he or she may seem to be, to inspire you upon a quest of unearthing others’ hidden talents from childhood and beyond, and to encourage you not to pass by a quarter trinket because gifting one can create amazing moments you might not ever imagine without your fad piece! I will always proudly boast my moondoggy’s hidden talent as I flash my quarter machine painted black and gold engagement ring! 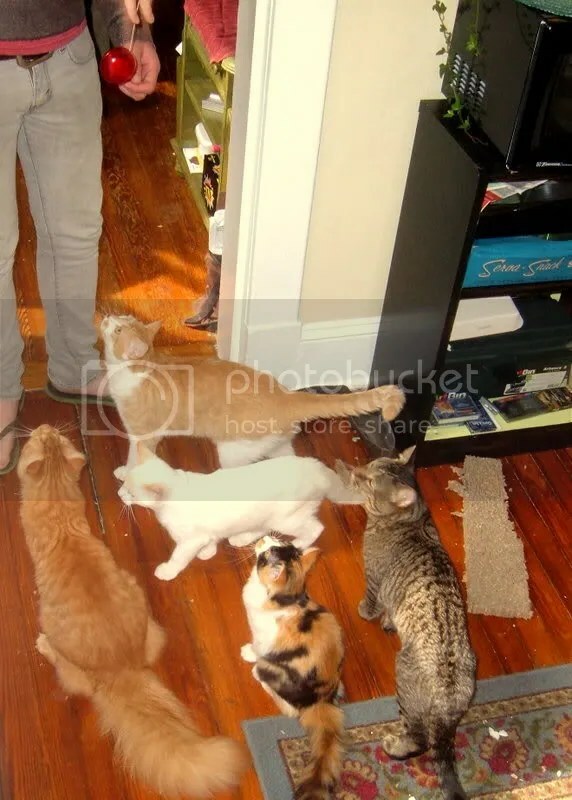 Pictured are my moondoggy, the cheapie red Duncan, and our family of cats: Dr. Hot Dog, Casper, Amelie, Thora, and Riley. Can I get a little tenderness, please? ?